Three key instruments that can help you meet your financial goals while also allowing you to enjoy tax deductions are ELSS, term cover and health cover, says Sanjay Kumar Singh. As your office asks you to submit proof of the investments you have made to enjoy tax benefits in this financial year. Three key instruments that can help you meet your financial goals, while also allowing you to enjoy tax deductions (and regarding which we have received the maximum number of queries from readers) are equity-linked saving schemes (ELSS), term cover and health cover. With so many mutual fund houses and insurance companies hawking their products, making the right choice can be difficult. In this article, we focus on some of the key criteria you should employ when selecting these products. Tax deduction on ELSS is available under Section 80C of the Income Tax Act. The fundamental advantage ELSS offers is that since it is an equity-oriented product, it has the potential to deliver higher returns over longer time periods than fixed income instruments that also offer tax benefit. It also has a shorter lock-in of three years compared to other products. If you leave the money invested even after the lock-in gets over, ELSS can prove a good vehicle for long-term wealth creation. The 10-year average compounded annual return of this category is 17.63%. But with 42 ELSS funds available, making the right choice can be difficult. One way to narrow the field is to select from funds that have at least a 7 to 10 year track record. "Look at calendar year returns over the long term," says P V K Mohan, head-equity, Principal Mutual Fund. "Go for a fund that has consistently beaten its benchmark over the past seven years, or done so a higher number of times," Mohan adds. Rolling returns (which most financial advisors go by) are another good way to select quality funds (please see table below: Top funds by rolling returns). "Avoid the mistake of selecting a fund that has been last year's best performer, or has done well in the recent past," says Deepesh Raghaw, founder, PersonalFinancePlan.in, a Sebi-registered investment advisor. He prefers funds that have a lower turnover ratio (where the fund manager churns the portfolios less). ELSS funds could be large- or multi-cap oriented. “If you already have a high percentage of large-cap funds in your portfolio, go for an ELSS fund that is multi-cap oriented, or vice-versa," adds Mohan. You get get tax deduction under Section 80D on the premium paid on health insurance for yourself, your spouse, dependent children and parents. The deduction is limited to Rs 25,000 a year on the premium paid for self and family. If you are a senior citizen (more than 60 years of age), you can claim a deduction of up to Rs 50,000. "A person can also claim the deduction of Rs 25,000 if s/he pays the premium for her/his parents whose age is not more than 60 years," says Archit Gupta, founder & CEO, ClearTax. "If her/his parents are senior citizens then s/he can claim Rs 50,000 under Section 80D. Thus, one can claim a tax deduction of Rs 50,000 on the premium paid for self, spouse, dependent children and parents who are not more than 60 years old," adds Gupta. "The tax deduction can go up to Rs 75,000 if the premium paid includes the amount paid for senior citizen parents." How much health insurance cover you buy should depend on the number of members in your family. "If you are a 25-year-old bachelor, you may buy a sum insured of Rs 3 lakh for yourself. On the other hand, someone who is 35 and has both dependent children and parents may need to buy a higher sum insured of, say, Rs 5 lakh to Rs 10 lakh," says Arvind Laddha, deputy chief executive officer, JLT Independent Insurance Brokers. "Senior citizens (husband and wife) may buy a cover of Rs 3 lakh to Rs 5 lakh, going up to Rs 10 lakh," Laddha adds. During the past few years, the cost of health cover for senior citizens has gone through the roof, so affordability has become an issue for them. Those living in metros need to get a higher coverage than those living in tier-II or III cities. If there is a family history of cardiac ailments, cancer, etc, such people too need to buy a higher sum insured. Buy according to your need and not just by the amount of tax deduction you get. When selecting a policy, try to avoid those that come with restrictions. The most important is room rent cap. If the cap on room rent is one per cent of sum insured, make sure you buy sufficient cover so that you can get a single room (if that is what you would like) in the type of hospital you would like to go to. "Policy buyers should also try to avoid policies that have a cap on the treatment of specific diseases and co-payment requirements. Prefer a policy with a lower waiting period," adds Laddha. Make sure that the hospitals you are likely to go to are included in the list of the insurer's network of hospitals. Brokers like Secure Now offer ratings of health plans which you may consult. The premium for your term cover also allows you to get tax deduction under Section 80C. Go by the following rule when deciding how much insurance you need: your family's net worth plus life sum insured should be adequate to take care of financial goals, square off liabilities, and meet expenses. It should be enough so that the family's lifestyle does not get compromised in case something happens to the breadwinner. "A wise move is to buy a term insurance policy at an early age, when premiums are low, that provides coverage for a longer duration," says Mahavir Chopra, director-health, life and strategic initiatives, Coverfox.com. Laddha suggests going with a strong and credible brand. "Insurance is a long-term, 20-30 year contract. Going with a strong brand will ensure that the insurer will still be around when the need arises," he says. To ensure that you get a good premium rate, Chopra suggests comparing quotes online and then selecting a cover that fulfils the criteria you are looking for. Some of the riders you may consider including in the base policy are waiver of premium, accidental death, accidental disability and critical illness. Note: Of the 42 ELSS funds, we selected top 20 by Sharpe ratio (a measure of risk-adjusted return). From them, we selected the top seven by rolling returns. Rolling returns were calculated for 3-year returns at one month periodicity over a five-year period. We got 43 data points (not 60, due to market closure and other issues). 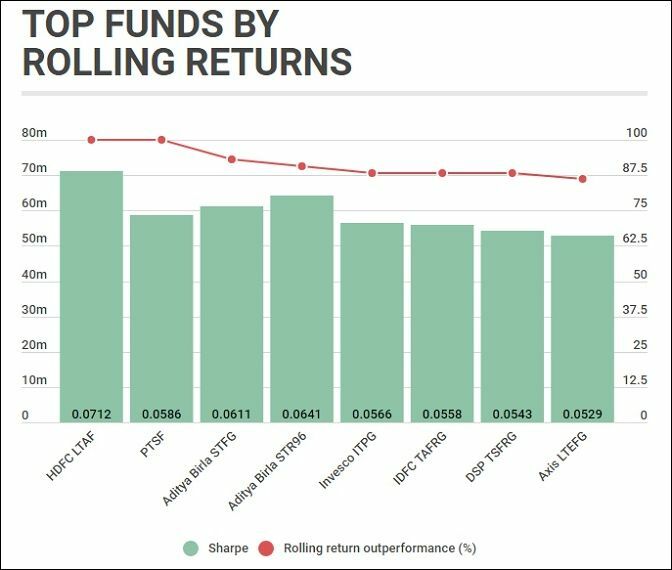 The data in the third column shows the percentage of times a fund beat its benchmark.